In the United States, 5.4 percent of the age five-to-seventeen demographic has a disability. This large population’s options for contemporary clothing have long been woefully limited. 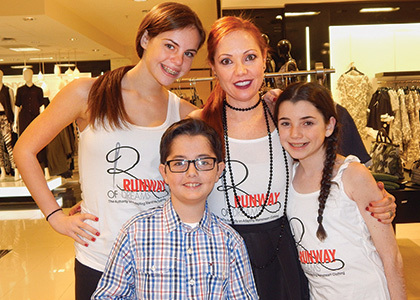 Enter Mindy Menkowitz Scheier ’93, founder of Runway of Dreams, a nonprofit organization leading change in the fashion world and in our perceptions of differently-abled people. The alumna notched a major achievement this spring with Tommy Hilfiger’s inaugural launch of a collection tailored to differently-abled youth. As a fashion design major at UVM, Scheier was singularly focused on her dream of someday becoming a big designer. She took advantage of the College of Arts and Sciences’ dual program with the Fashion Institute of Technology to study abroad in Italy her junior year. After graduation, she worked for many years as a designer and stylist for in-house labels at top retailers such as Saks Fifth Avenue and Bloomingdale’s. It was a watershed moment that galvanized Scheier’s commitment to making mainstream clothing wearable by her son and other children in the differently-abled community. Entrepreneurial spirit primed, Scheier knew she needed solid data behind her before approaching the fashion industry. She researched the adaptive clothing market. Most of what she found was “medicinal” and “purposeful,” lacking style and flair—in essence, sartorially marginalizing people with disabilities. In February of this year, Scheier’s work came to fruition with Tommy Hilfiger’s launch of its first collection of kids’ adaptive clothing. The collection ranges in size from 4-20 for boys and sizes 4-18 for girls and captures the aesthetic of the mainstream line, but with adaptations that make it wearable by differently-abled youth. Modifications include such features as MagnaReady® magnetic closures to replace buttons and zippers, adjustable length and leg openings, Velcro flies, and alternate ways of getting in and out of clothing. Runway of Dreams has received a whirlwind of media attention, from a fashion show on “The View,” to articles in USA Today, People, the Huffington Post, and more. The are currently developing additional partnerships with brands and retailers hoping to create clothing lines at all price points for people of all ages. Runway of Dreams’ visibility has taken her entire family on an incredible journey. For Scheier’s son Oliver, the exposure to a vast community of people with disabilities has helped him feel less alone and “part of something enormous.” For all three of the family’s children, this work has demonstrated that if you believe in something, have a dream, and work really hard, you can accomplish anything. “They see my womanpower,” Scheier says. More information: runwayofdreams.org and tommy.com. Scheier also invites the UVM community to like her on Facebook and follow her on Twitter.